Having a patio is a definite value-add to your property. This space gives you the opportunity to relax with family and entertain friends in an open space in the comfort of your home. But you also need to make sure that these spaces are designed and installed by experts, using good quality materials. This is where we come into the picture. We at Rou Pavers are one of the leading companies in the hardscaping space and have created a distinct niche for ourselves in the industry. Our company has handled a significant number of patio installation projects for clients in and around Pensacola, Golf Breeze, Pace, and Milton. Our experts have designed and constructed impressive residential patios on properties in Navarre, Navarre Beach, as well as Pensacola Beach. Our expert patio designers keep all these aspects in view and then provide detailed designs and plans that will improve the functionality and aesthetics of the available space. We work very closely with you; use the best quality materials in our work and skilled and experienced local patio installers handle the job. 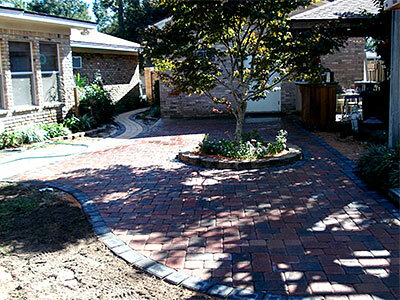 Most people today opt for paver patios. These could be made of brick, concrete or natural stone paver units. Not only are these materials resilient and durable, but are very versatile too. You can choose from pavers of different colors, shapes, designs, patterns, and styling to create the kind of look you want on your property. We have the expertise to handle every kind of job with professionalism. Whether you want a new patio installed or need an existing on replaced, we can provide you the services you need. Our on-site supervisors make sure that the installation is carried out meticulously and with the least amount of disruption to the daily activities on your property; the project will be completed within the promised timeframe and to your 100% satisfaction. If you are looking for patio installation contractors that will cater to your specific needs and give form to your ideas, we are the company to come to. For any more information on our services and patio cost, feel free to contact Rou Pavers at 850-791-5641. You can send us your project details via this Contact Us form or request a free estimate and one of our experts will get in touch with you shortly.